Heat oven to 350°F (325°F for dark or nonstick pan). Make and bake cake mix as directed on box for 13x9-inch pan. Cool completely in pan, about 1 hour. Pierce cooled cake with fork at 1/2-inch intervals. In medium bowl, stir gelatin and boiling water until dissolved. Stir in cold water. Carefully pour mixture over entire surface of cake. Refrigerate at least 3 hours until serving time. In large bowl, mix pudding mix and milk until well blended. Gently stir in whipped topping. Spread over cake. Arrange strawberries and blueberries on top of cake to look like flag. Store loosely covered in refrigerator. 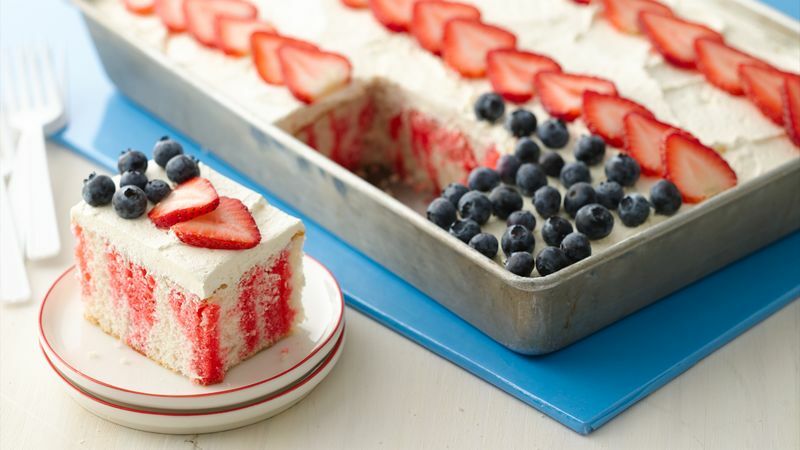 To show off the red, white and blue of this cake, cut into serving-size pieces and arrange on a platter. Top each piece of cake with a tiny American flag available at craft stores. Garnish the platter with whole strawberries and blueberries.